For fans of The Happiness Project and The Year of Living Biblically comes a pointed look at our fascination with celebrities, as one woman strives to remake herself in the image of her favorite stars. What woman hasn’t seen pictures of Jennifer Aniston, Gwyneth Paltrow, or Beyoncé and wished she had their clothes, their abs, their seemingly flawless lives? For Rachel Bertsche, these celebrities are the epitome of perfection—self-assured and effortlessly cool. Yet lately, between juggling her career, her marriage, and her dream of becoming a mother, Bertsche feels anything but put together. 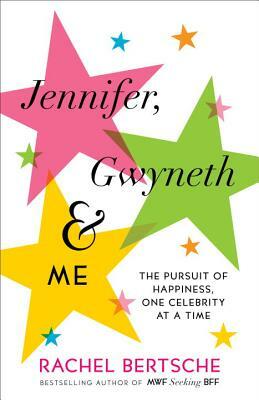 In Jennifer, Gwyneth & Me, Bertsche embarks on a quest to emulate her Hollywood role models—while sticking to a budget—to see if they really hold the keys to happiness. While trying to unlock the stars’ secrets, from Sarah Jessica Parker’s wardrobe to Julia Roberts’s sense of calm to—maybe one day—Jessica Alba’s chic pregnancy, Bertsche learns valuable lessons. A toned body doesn’t come easy or cheap, avoiding social media can do wonders for your peace of mind, and confidence is the key to pulling off any outfit. But can she immerse herself in the A-list lifestyle and still stay true to herself? And will her pursuit of perfection really lead to happiness? Rachel Bertsche is the bestselling author of MWF Seeking BFF. She is also a journalist and editor, whose work has appeared in O: The Oprah Magazine, Marie Claire, More, Teen Vogue, Seventeen, Every Day with Rachael Ray, Fitness, Women’s Health, New York, Huffington Post, and more. Prior to leaving the office life for the comforts of working from home (and in her pajamas), Bertsche was a producer for Oprah.com and an editor at O: The Oprah Magazine.